This crypto-family list of weather words engages students' brain, encourages vocabulary development while activating problem solving strategies. To solve the puzzle requires letter substitutions. Start with the letter hint provided in the chart: substitute the letter |U| for the letter |P|. Next, identify one word and then use the known letters to help with the decoding of other words. 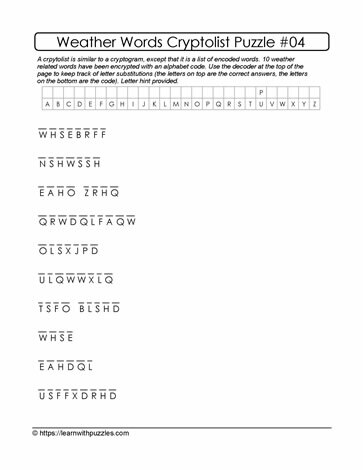 Record and track letter substitutions in the chart in the puzzle.